Filipino workers have a reason to be happy if Senator Cynthia Villar's bill will be approved and become a law in the near future. Villar filed Senate Bill 147, seeking an adjustment in the income tax rates, which will greatly benefit all workers belonging to different income tax brackets. Senate Bill 147 is primarily meant "To ease the burden of our Filipino workers, and for our country to be at par with regional standards and to make the Philippine workforce more competitive with its neighbors," Villar said. The bill will specifically amend Section 24 of the National Internal Revenue Code of 1997, as amended. 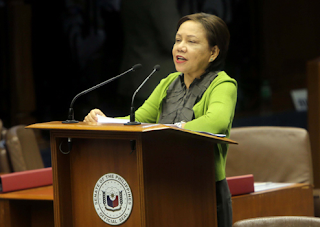 Sen. Villar said that the Philippines has one of the highest income tax rates in the Association of Southeast Asian Nations (ASEAN), surpassed only by Vietnam and Thailand. The new reduced income tax rates proposed in Senate Bill 147 will make Filipino workers grin from ear to ear, since it offers big reductions compared to present tax rates. For example, the lady senator is proposing that those with taxable incomes of not more than P20,000 will have 5% tax rate beginning January 1, 2016. Compare that to the previous rate of 5% for those with taxable incomes of not over P10,000. Just by looking at the proposed reduction in income tax rates, we are sure that a lot of individual taxpayers are already computing the additional disposable income they will have once Senate Bill 147 is approved. A few thousand pesos of additional disposable income will go a long way for millions of Filipino workers who live by very tight budgets. And even if it means lower income tax collection for the government, that disposable income will be pumped back to the economy, anyway. Only this time, it will come from the taxpayers and not from the government itself.